From an LGBT online media publisher perspective, this is probably the most important overall concept in terms of maximizing online revenue from banner ad placements. In this instance, it’s all about banner ad impressions. Let’s use some typical website performance statistics and ad rates here. If your site receives 1,000 visitors per day, that’s 30,000 visitors in one month. If one visitor typically views 10 pages on your website, that’s 300,000 page views per month. If each page typically has 5 ad units on it, including one at the top and bottom of your site and 3 in the content or on the side, that’s 1,500,000 ad impressions your site can deliver in one month. If you were able to sell 100% of your banner ad inventory at $5 CPM, that would be $5 for every thousand banner ads served - $5 x 1,500,000/1000 = $7,500. That’s the reason you want to earn revenue for every banner ad you deliver… you may sell some premium, top placement ads in-house for $10-15 CPM or more, but that would balance out with those lower-tier network ads being placed for $1-2 CPM (which are hopefully less than 10% of all of your banner ads served). We performed a variety of tests, ensuring all variables except for CPM rate remained the same… we then adjusted the CPM rate to $4, 5 and $6 CPM for programmatic ad placements on tested sites and let it run for a week. 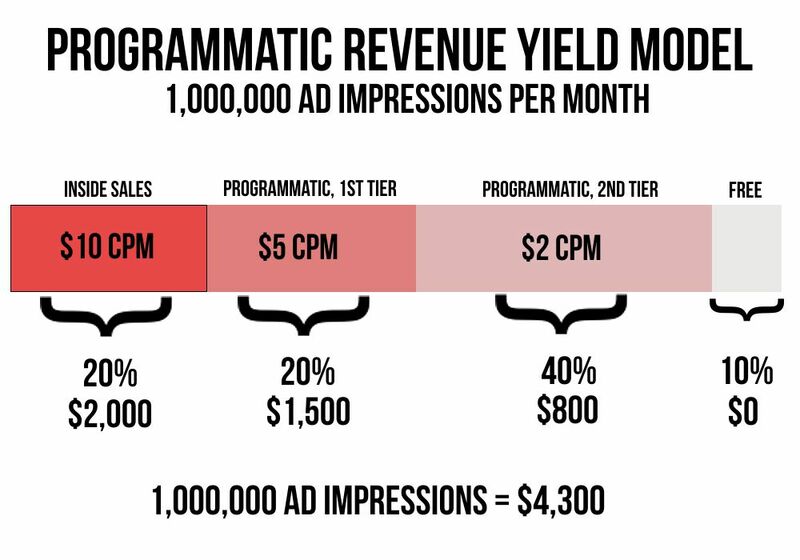 We found that the number of ads placed at the lower CPM rate did grow slightly (which makes sense… less expensive CPM rates equals a wider pool of ads that the site can attract), but the overall revenue amount remained the same. The percentage of ads a programmatic ad placement can fulfill is called a “Fill Rate”. At $4, 5 and 6 CPM, the fill rates were 8, 7 and 6%, respectively. Revenue amounts remained close to the same. 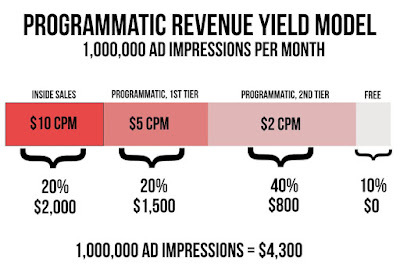 Thus, for our scenario, selling banner ad inventory on the programmatic ad exchange at $6 CPM makes sense. What is important is where it fits into the overall revenue mix. 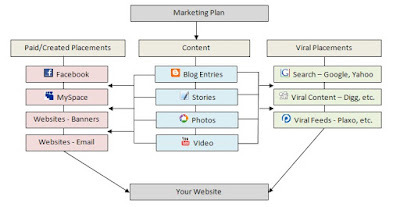 For a large site, a typical scenario would look like what is seen below. For a smaller site, the yield percentages go up dramatically, as there are only a fixed number of banner ads available in the LGBT world, and a smaller site’s percentage of ads dedicated to this fixed amount will inherently go up. As one can see, the biggest revenue variable is how many ads are sold in-house, as an overall percentage of banner ad impressions available. 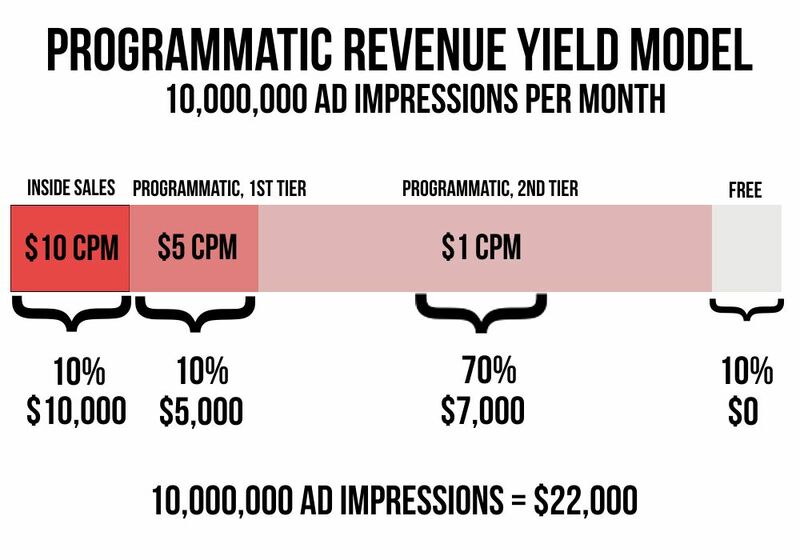 The second big variable is what happens to the banner ad impression slots made available after the 1st tier programmatic ad placement. Are they all sold at an average of $2 CPM, or is it lower at $0.50 CPM? How many are free or in-kind from various sponsorship and trade deals? 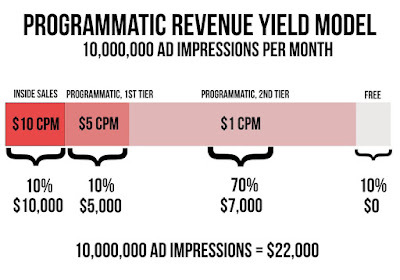 Some programmatic ad exchanges are able to combine the 1st and 2nd tiers into a series of “price bands.” Using rather complex algorithms, they’re able to completely manage the revenue maximization curve across all CPM price points, as seen in the chart below. Lastly, never underestimate the power of retargeting ad campaigns on the programmatic ad exchange, with companies such as Amazon targeting THEIR customers on YOUR site… the CPM rates on these are high, as they are considered high-quality, pre-qualified leads. This is all added revenue in your pocket. Understanding where your company lies on the yield charts above, and adjusting accordingly to maximize revenue, can make a pretty significant difference in an LGBT media company’s bottom line. To learn more about how programmatic ad buying works, check out our recent blog posts "Look Who's Making A Comeback - LGBT Banner Ads" and "Programmatic Ad Buying Using Your LGBT SEO and PPC Campaign Search Terms". To learn more about how to reach an LGBT audience BEYOND the traditional LGBT websites, check out "Target LGBT Audience on Huffington Post, DailyBeast.com, Jezebel and more". For LGBT publishers, check out "LGBT Programmatic Advertising and the Concept of the Ad Network Waterfall"